From the moment of our conception, we grow to a rhythm of a beating hearts; our mother’s and, soon, our own heart too. That instinct for the pattern of a beat instilled in us then never leaves us, especially if it is nurtured through music. Watch any group of people when music with a strong beat starts up. We all start swaying and stamping and clapping and nodding. It’s innate in us, and one of those things, like stories, which works magic on whoever hears or feels it, making us feel things. 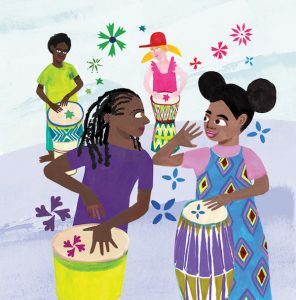 This silky-smooth, chunky, square little book of simple rhythmic phrases and bright joyful pictures of people and animals dancing is written by Ken Wilson-Max, and illustrated by Catell Ronca. It is the first in a new series of books, ‘Children, Music, Life’, from innovative publisher Tiny. It doesn’t tell or show a story; it simply celebrates that coming together, summoned and orchestrated by the beat of a drum. It’s a sort of party, and the book invites you to join it. So, go on and enjoy your own ‘drum of life’, and ‘feel the beat in your belly’ as you share this lovely book with the small people in your life! 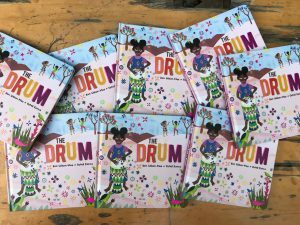 Read a blog: Dancing and singing, launching The Drum!